(CNN) -- The sad state of the economy doesn't appear to be affecting the festive mood in New Orleans, Louisiana. 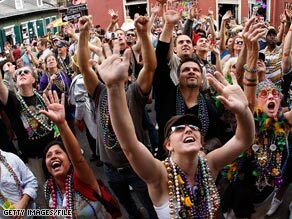 A crowd of people try to catch beads on Bourbon Street on Fat Tuesday last year. "Things are sort of buzzing down here right now, and it feels good," said Michael Valentino, a local businessman who owns three hotels in the French Quarter. "Didn't know what to expect this year, but it appears that interest is high and people are acting on that decision in order to make Carnival part of their travel plans." Hotel bookings are on pace with last year, and the city is anticipating between 700,000 and 800,000 Mardi Gras visitors this year -- at least as many as 2008. Some tourism officials and business owners expect this year's attendance to top last year's numbers because Fat Tuesday, on February 24 this year, falls nearly three weeks later, giving visitors more time to plan and budget for the trip after the winter holidays. Other early indicators also are promising. Crowds for last Friday night's Pygmalion and Oshun parades were as thick as Valentino has ever seen them. He operates bleachers along St. Charles Avenue and is on the street every year. Typically the early, smaller-scale parades don't draw much attention, he said. "It just appears that people feel the need to relax and celebrate, and Mardi Gras is an opportunity to step back from what they're dealing with every day and spend a little time in a mellower, less threatening, more carefree type of an environment." Despite high expectations for Mardi Gras, the city's tourism industry hasn't completely dodged the economic downturn. Valentino has seen a dip in corporate and meeting inquiries at his hotels and less interest from leisure travelers during times that don't surround special events. Still, visitation levels for the first quarter of 2009 have remained strong, according to the New Orleans Metropolitan Convention and Visitors Bureau, which spokeswoman Kelly Schulz attributes to meetings and conventions, Mardi Gras and marketing efforts to promote the city as a value destination compared with other popular American cities. New Orleans' sparkling culinary reputation is part of its unique draw, and Patois, an Uptown restaurant away from the throngs of revelers in the French Quarter, is looking forward to a strong weekend. By Thursday afternoon, the 60-seat restaurant had 90 people on the books for Saturday night. Chef-owner Aaron Burgau said business has been better since the beginning of the year. Patois is closing Sunday, when the restaurant usually is open for brunch, and Burgau plans to ride in the Bacchus parade for the first time Sunday night. The ride comes at no small cost: Burgau estimated he spent about $2,500 on beads, krewe dues, a float assessment and other expenses. Orders from krewes for beads and other throws are up this year, according to Daryl Fletchinger, owner of retail store Mardi Gras Spot and a wholesale business. "Interestingly, everybody wants to put all of the sad, pessimistic, negative news out of their minds and do something that's very normal for New Orleanians, and that is put on the greatest free show on earth."